Acetylene systems present a new route to cyclic compounds as an alternative to more traditional methods employed in classical organic chemistry. The synthesis of cyclic structures based on acetylene systems has important applications in the formation of nanostructures, naturally occurring compounds and chemosensory materials for the design of nonlinear optics, electronic and photonic devices. Alkynes in Cycloadditions presents a modern review of regioselective synthesis of aromatic and non-aromatic carbocyclic and heterocyclic ring systems based primarily on [2+2+2] and [4+2] cycloadditions, and other reactions of acetylenic units including enediynes and enyne-allenes. New strategies for the formation of aromatic and polynuclear hydrocarbons based on (Z)-hex-3-en-1,5-diyne and (Z)-hepta-1,2,4-triene-6-yne blocks. One-step synthesis of benzene derivatives, β-substituted naphthalenes and acenes by the cycloaromatization of enediynes and enyne-allenes by Bergman, Myers-Saito and Shmittel. Mechanisms of cycloaromatization resulting in the formation of fulvene and indene systems. 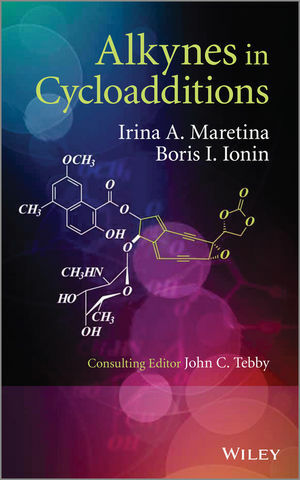 Alkynes in Cycloadditions presents a comprehensive summary of the literature on methods for the synthesis of ring systems from acetylenes for academic researchers working in the fields of organic synthesis, physical organic chemistry, organometallic chemistry, catalysis, materials science, nanomaterials and biochemistry. Professor Irina A. Maretina, St Petersburg State Institute of Technology, St. Petersburg, Russia. Irina Maretrina is a well-known name in the field of acetylene chemistry. Her research focuses on the chemistry of alkynes, in particular diacetylenes and the synthesis and reactivity of unsaturated heteroatomic compounds, including nitrogen-containing heterocyclic compounds. Professor Boris I. Ionin (Translator), St Petersburg State Institute of Technology, Department of Organic Chemistry, St Petersburg, Russia. Boris Ionin is a renowned organic chemist specializing in acetylene and phosphorus chemistry, and nuclear magnetic resonance. He is an Editorial Board member for the Russian Journal of General Chemistry and Editor for the English translation of this journal. John C. Tebby (Consulting Editor), Emeritus Professor FRSC DSc, former Head of Chemistry, Staffordshire University.